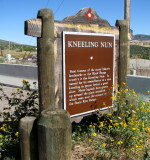 The Kneeling Nun is a rock formation near Santa Rita, New Mexico, and also at the edge of an open pit copper mine owned by Chino Mines. Th erock formation is a 90-foot tall pillar of volcanic tuff. The rock pillar was named for its resemblance to a nun kneeling at an altar and, according to legend, asking forgiveness for past sins.